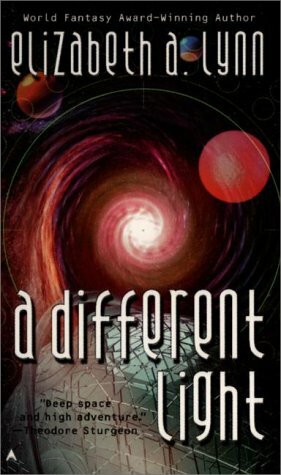 Vintage Sci-fi Month is almost over, and I thought I’d make the concluding post about a book that I have not seen widely reviewed: A Different Light by Elizabeth Lynn. We are right on the cusp here, as it was published first in 1978 (the arbitrary cut-off for the Vintage Sci-fi month was set at 1979). There are some mild spoilers ahead. A Different Light is a short book, but it’s not a quick one. The plot is not its strongest point (which is why I think I can’t really spoil it for you). Where it really shines is in the way it talks about human emotions, dying, and loss. The main character is Jimson Alleca, the only person on New Terrain who has cancer. Everyone else gets their predisposition to it detected and corrected at birth. Jim has his managed with drugs, but he will never live as long as other people, and he cannot leave the planet because it would kill him. Jim is disillusioned and tired. He is an artist, but he is tired of his own art and doesn’t feel he can create anything new. He wants to go off-world, to see ‘a different light’. Yes, he knows it would mean cutting his lifetime even shorter than it is, but at this point, he does not particularly care. He is suffocating where he is. Jim gets his chance when his ex-lover Russell reappears after 14 years of being away. Russell is a daring star captain, and he is the source of both space and emotional adventures in this book. He is on a mission to steal something very valuable from a different planet for a client. He is also very much the object of Jim’s love, hurt, and anger. One thing that is almost always mentioned with regards to this book is that it gets major LGBT props: Jim is bi, but this is never stated openly. There just doesn’t seem to be one ‘more accepted’ sexual orientation in Lynn’s universe. He dates Keiko, who is a female pilot, but he is also obviously in love with Russell. Gender is not important. A Different Light is ultimately a book about loss. From page one you realize that this book is written as a a snapshot of ephemeral human life. It shows you that nothing lasts, and that’s why reading it feels like a bittersweet ache. She leaned over the observation railing, watching the space where the ship had been, head on one side, as if she were listening to the wind rushing in to fill the space. 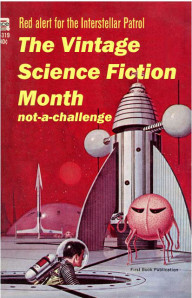 I doubt I’ll have time to read and write about something else for the Vintage Sci-fi Month before it’s over, but as always, if you need more vintage goodness, head to Little Red Reviewer’s blog. Big thanks to Little Red for hosting this vintage sci-fi experience and for letting me read some stuff I otherwise wouldn’t have picked up!